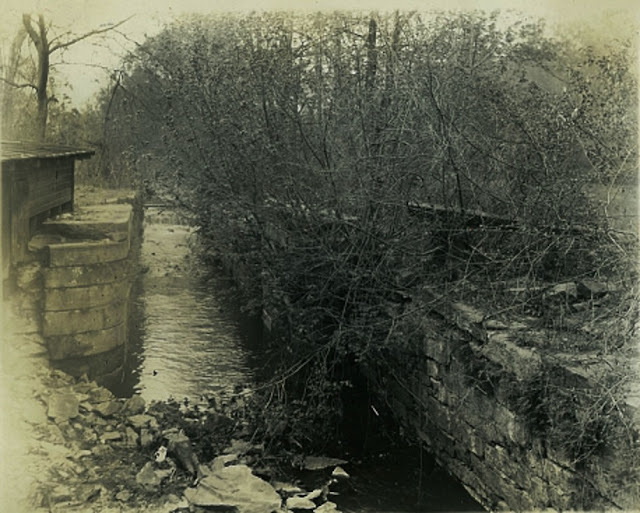 The Leiper Canal above was not very wide as seen above, an unknown location today. In the year 1790 Thomas Leiper and John Wall, wealthy and respected citizens of Delaware County, Pennsylvania, supported by a petition from the stone cutters and masons of Philadelphia, brought before a meeting of the Assembly, a project for the construction of a canal, along Crum Creek in Ridley Township for the purpose of completing a navigable communication between Leiper’s quarries on Crum Creek and the Delaware River, a distance of little over a mile. Mr. Leiper also desired the privilege of cutting a canal from the flowing of tide in Crum Creek to McIlvain’s mill dam, in order to cheapen the cost of transportation of his stone from the quarries to tide water. The mechanics were all of the opinion that Mr. Leiper’s stone was the best ever produced in the neighborhood of the city and that the building of a canal would be of the greatest advantage to the general public. At the next meeting of the Delaware County Assembly, when it was supposed by Mr. Leiper and his friends that the measure would be passed and permission granted for the immediate construction of his proposed canal, it was unfortunately met with the greatest opposition by John and Isaac McIlvain. Upon examination the topography of the proposed canal, we very naturally see the reason for the remonstrance on the part of the McIlvains. Mr. Leiper wished to enlarge into a canal, the old mill race, which led from McIlvain’s to Leiper’s mills, the latter standing just below the big road, passing through the town of Ridley, now Leiperville. IN justice to Mr. Leiper, however, it must be said that the McIlvains were not entirely dependent upon the race for their motive power. Others thought Mr. Leiper’s enlarged views were in advance of the age in which he lived, and his scheme was considered visionary and ruinous, and the law which he solicited was refused. Mr. Leiper thus foiled in his favorite plan, afterwards universally acknowledged to have been expedient and wise, began to look around for some other means by which he could transport his material, but it was not until 180-9 that his scheme for constructing a tramway was first proposed, as a means of connection between his quarries and tide water in Ridley Creek, and this railway will ever be distinguished as the first ever built in America. “We have the pleasure to inform the lovers of domestic improvements that a satisfactory experiment at which we were present was lately made in this city, by Mr. Thomas Leiper of the great utility of railways for the conveyance of heavy burdens - an improvement which a few years ago was introduced into England – as in many cases a cheap and valuable substitute for canals. In the above experiment a railway was laid of two parallel courses of oak scantling, about four feet apart, supported on blocks or sleepers about eight feet from each other. On this railway which had an ascent of 1 ½ inches in a yard or 2.22 a single horse, under the disadvantage of a pat of loose earth to walk on hauled up a four wheeled carriage, loaded with the enormous weight of 95 ½ hundred weight, or 10,696 pounds. “I wish to contract for the digging part of a railway from my quarries on Crum Creek to my landing on Ridley, the distance and level has been accurately ascertained by Mr. Reading Howell, engineer; the distance is exactly three-fourths of a mile and an accurate statement of the quantity of digging required, may be seen from the plot in my possession, calculated by Mr. Howell. I also wish to contract for the making and laying the rail part of the same, consisting of wood, a specimen of which as furnished by Messrs. Large and Winpenny, may be seen by applying to them at their manufactory adjoining the Bull’s Head on Second Street in the Northern Liberties. The scantling for the above will be furnished on the ground. I wish to progress in this work immediately. GEORGE G. LEIPER on the premises of THOMAS LEIPER, Tobacconist, No. 274 Market Street, September 27, 1809. The draft of the road was made by John Thompson and the work of building and grading was finished early in the spring of 1810. It began on the south bank of Crum Creek, opposite the old saw mill at Avondale and terminated near the hand of Ridley Creek near. Irwin’s factory, at that time the property of the late Pierce Crosby. The ascents were graded inclined planes, and the superstructure was made of white oak with cross ties and string pieces. The road was built upon an ascending grade of 167.2 perch at a rise of a little of ¾ of an inch to the yard to a dividing summit, thence it descended 87.4 perch at about 1/34 inch to the yard, thence to the terminus 79.65 perch, at about 1 ½ inches to the yard. The entire length 33 ¼ perches, ore one mile 14 ¼ perches. The total rise was about 63 feet. The total descent from 5 or 6 feet more. The wheels of the cars and trucks were made of cast iron and flanges. The road after it was finished in 1810 continued in use until 1823, when it was superseded by a canal, after the plan first made by Mr. Leiper but not carried into effect until three years after his death, when his son the Hon. George Gray Leiper, concluded the work which had always been nearest and dearest to his father’s heart. The cornerstone of the first lock of the canal was laid by William Strickland, a celebrated architect and engineer on August 16, 1828. A UNIQUE CEREMONY – The sight at the corner stone laying was a very unique one, about 11:30 on the morning of the occurrence, a procession moved toward the canal lock, to see the grand ceremony performed. The scene was novel as well as interesting to the citizens of Delaware County, as well as visitors from Philadelphia, and the event was one to be hailed by future generations and the beginning of a glorious and enterprising epoch, especially to that section of the country. The large concourse of ladies and gentlemen present who had assembled from the city and neighboring villages to witness the beautiful sight gave an interest to the ceremony truly grand and imposing. Among the group of ladies was to be seen Mrs. Elizabeth C. Leiper, the aged and amiable consort of him, who had first projected this great work, who had lived to see what was first suggested by her husband commenced by her eldest son, George Gray Leiper. ORIGINAL RAILROAD MAN – Thomas Leiper may truly be demonstrated as the first inventor of railways. With him originated the plan for the construction of the first railway in America, and which was completed in 1897. After the cornerstone was properly adjusted by the engineer a short address was read by Prof. Patterson of Philadelphia, a copy of which was put in a small bottle and deposited in the cornerstone by one of the granddaughters of the venerable projector. After the close of the ceremony, the entire company was invited to the hospital mansion of the Leipers, and partook of an excellent dinner, after which a variety of toasts, applicable to the great work which had on that day been christened, was drunk. Immediately at the close of this part of the ceremony amid the good wishes of a numerous assemblage of friends and neighbors three hearty cheers were given by the spectators. The jovial bowl was then passed around and several excellent toasts were drank upon the ground. The following sentiment was given by our worthy fellow citizen Joseph Gibbons. George Gray Leiper, one of the Keystones of Delaware County. He has just laid the first stone of the first lock of the first canal in Delaware County. May he live to reap the fruits of his great work which has this day been commenced.